Revisiting their financial role with regard to MARTA might be a good start. To me the fact that MARTA is the only large metro transportation system that receives no state funding is a frank embarrassment. And they sure don't mind sticking their nose in MARTA's business despite that. Those conversations seem to be already underway at the state level. It's just that it may be many years before any solution is formed about state funding of an agency like MARTA in a state where just the concept of transit as a legitimate form of transportation has been shunned, demonized and demagogued for decades. And even if and when there were to be a state funding solution for MARTA, it likely both may not come soon enough and likely may not be enough to dramatically improve the traffic situation along this particular stretch of North Druid Hills Road just simply because of the nature of traffic congestion that this particular area generates...commercial, medical and educational facilities that generate much drive-up traffic like many posters have noted. Convert 2 lanes of NDH to bus-only, during peak hours. Focus transit improvements on making the bus a better option, as rail is not going to work in this area. Your comments raise an excellent point.....That instead of this particular area being home predominantly to the lower-density car-centric development of decades, it seems to quickly be becoming the site of higher-density car-centric development that generates even higher amounts of automobile traffic than the lower-density car-centric development of years and decades past. The location of this development, at the northeast corner of what is already a very busy I-85/North Druid Hills Road interchange, indicates that despite the increased density, it is being built with automobile access (to and from I-85) in mind first and foremost....Something which is not a knock against CHOA as they already owned the property in this area and I-85 is a very busy regional artery and transcontinental superhighway that makes the new medical facility accessible from virtually anywhere in the region and/or the state and/or much of the Southeastern U.S....But the lack of emphasis on improving transit access in an area that already struggles with traffic congestion during peak hours should be concerning. The diverging-diamond idea that you state may likely be one of the only attempted solutions that the state ever implements as a way of attempting to improve traffic in this area. Converting the I-85 HOV lanes to toll lanes and building a BRT station in the northeast quadrant of the I-85/NDH interchange is a good idea. The state already seems to be seriously contemplating converting the HOV lanes on I-85 Northeast ITP to toll lanes as part of their long-term plans to eventually convert the entire existing HOV lane system to a toll lane system. Though, building a BRT station at the I-85/NDH interchange most likely would be a much heavier lift because there is no available land remaining to further expand the I-85 right-of-way horizontally (as I noted in an earlier post, the I-85 roadway was expanded from a previous width of 4 lanes to its current width of 12-14 lanes as part of the massive "Freeing-the-Freeways" Atlanta-area roadway expansion project of the 1980's)....So the only way to add in new BRT infrastructure would be to expand the right-of-way vertically, most likely by elevating any converted and/or new HOT/BRT lanes out of the median of I-85 and over the existing NDH overpass at I-85, something that would be very expensive for a state that continues to struggle with a limited transportation budget despite recent motor fuel revenue increases. A BRT system along I-85 is not a total impossibility and most likely should be up for consideration considering that many commuter buses (most notably from GRTA Xpress and GCT) already operate in the current I-85 HOV lanes between Central Atlanta and the Northeastern suburbs....But right-of-way issues and financial costs would make the implementation of a robust BRT system along I-85 Northeast a definite challenge. Thank you, I totally agree. I just named about 10 schools in that area where parents are frantically trying to get kids to school, then run other kid to preschool, then get to work all between 7 and 8 am. Some version of that is what most people are trying to do in the mornings--I don't think they'll be using the bus. And thus they are traffic. I walked to school plenty, biked to school, and rode the school bus. I even rode MARTA afterwards to after-school things. There are better ways to handle this area other than trying, perpetually, to serve every single car. ART in non-dedicated lanes will help, but will still be in traffic. 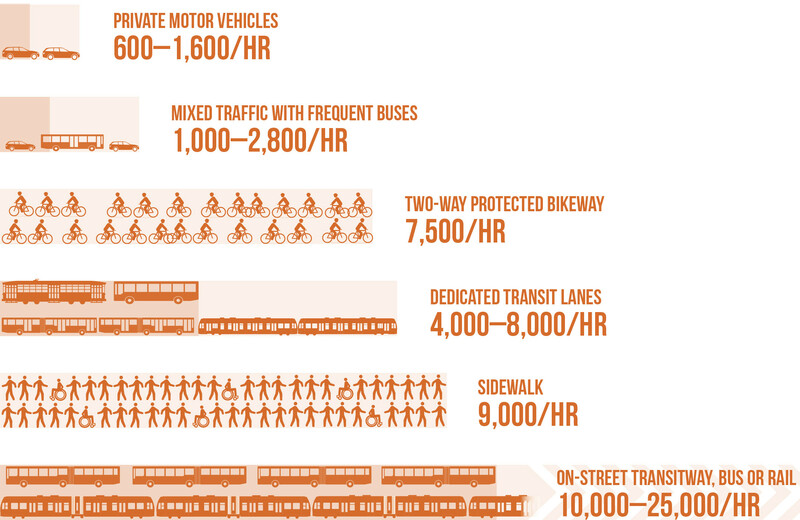 BRT in dedicated lanes will 'remove' lanes, but ultimately add capacity to the corridor, and would be a better bet. The Clifton Corridor will be the best option, though it will still require rebuilding the local roads. Add in some bike lanes, a multi-use path or five, and better pedestrian facilities, and traffic still won't be any better. There will, however, be a pile of alternatives for people to make use of, kids and all. They need some lights on the overpass of I-85. It's pitch black at night, I'll bet it's 1/4 mile gap between streetlights straddling I-85. Why this has not been remedied, I do not know. Because if traffic is already at a stand still, offering alternatives to that traffic is... a bad idea? A high-frequency, and high-capacity bus route, like the planned ART, would make much better use of the road space than the cars would. Because if traffic is already at a standstill, reducing vehicle capacity is an incredibly bad idea. Note that I italicized "existing" lanes. With the type of trips, these buses would be of limited use to the people on the roads. As mentioned there are schools and other trips that simply couldn't be well served by mass transit. My understanding is that the diverging diamond is best at intersections with lots of left turn activities. At Perimeter Mall, most of the traffic was turning left instead of going straight. At NDH and I-85, the north bound NDH turning onto South Bound 85 is the only really heavy left turn at that intersection (and a lot do go straight towards Buckhead). And that left turn gets backed up more by I-85 being at a standstill than the left turn signals. Entrance ramps further from the intersection could eliminate that problem. I didn't think about how traffic will be impacted, but yeah, it will be rough. I can use N. Druid to get home from work, but I avoid it completely. Our family has extensive experience with inpatient at both Scottish Rite and Egleston. I didn't realize until reading the link provided that Egleston's inpatient areas are all moving over to North Druid. Some of you might not be aware that things at Egleston are mostly packed. Hard to find parking in a huge deck, sometimes have to wait half a day after checking in to get a room. We never complained about it because of the great people who work there, but this new facility could make things much better for those who need pediatric care intown.